With summer here the kids and I are constantly on the go trying to get in as much fun family time as we can before school starts and of course we have to have cold drinks and some snacks to hold us over while driving to and from our favorite destinations. We usually take a cooler with us and load it with water and juice plus we grab some delicious snacks to enjoy in between meals as needed. One of my favorite snacks, as well as my kids, are delicious OREO cookies as they are always super tasty and they always hit the spot. 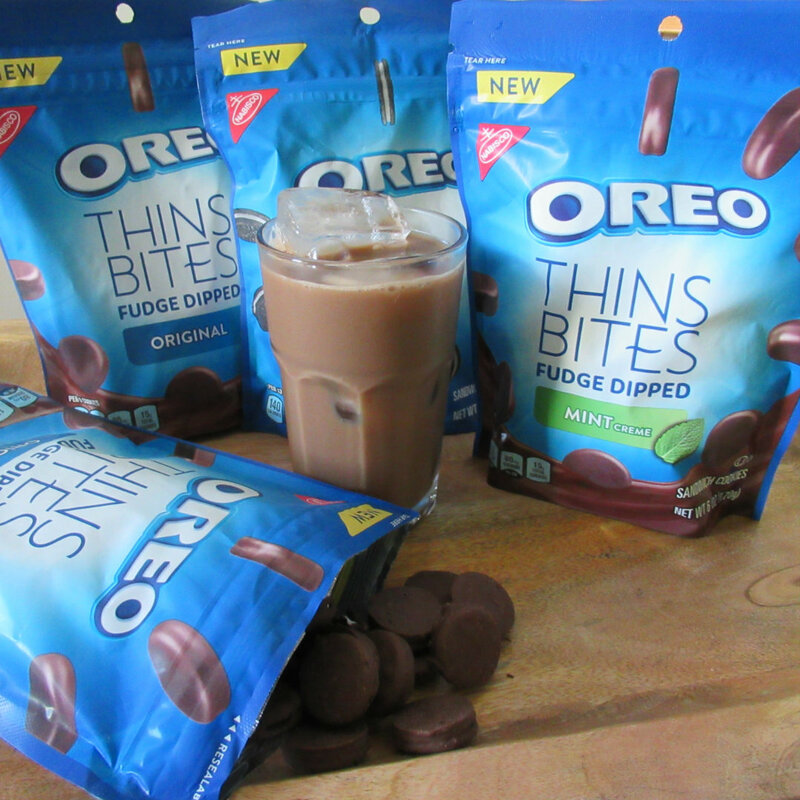 Recently, while shopping at my local Walmart, I found a few new OREO products that I knew my family and I needed to try so I grabbed the ID OREO Iced Coffee and the new OREO Thins Bites in Original and Mint. I love enjoying a frosty delicious iced coffee in the hot summer months instead of my normal hot coffee and the International Delight OREO Iced Coffee did not disappoint in any way shape or form. I actually had a bit of a hard time finding this delicious refreshing treat and now I understand why! It is simply delicious and I find that it is the perfect accompaniment to the delicious OREO Thins Bites that I picked up. It is perfect for dunking these little delicious treats! The OREO Thins Bites come in several varieties and they are all equally delicious. My family and I have been purchasing the OREO Thins cookies for a while now as we love the thin crunchy texture of the thins and the delicate amount of delicious OREO cream. 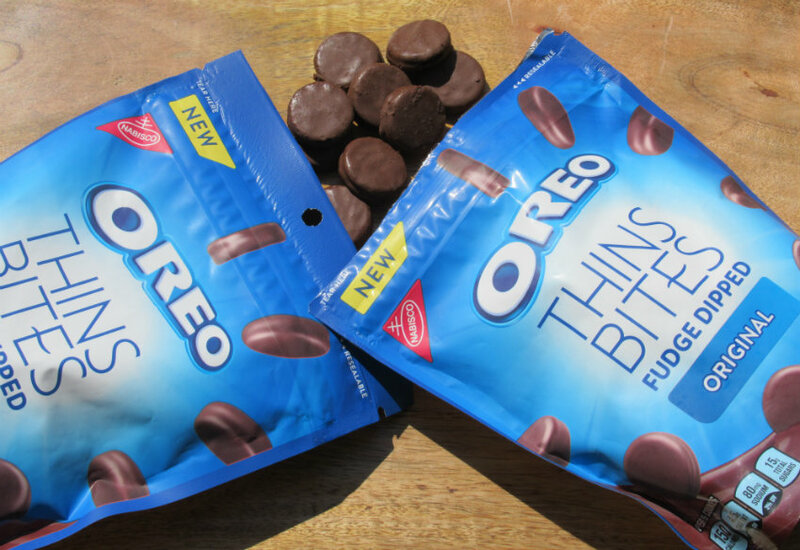 The OREO Thins Bites are the same thing, just bite sized which makes for the perfect on-the-go snack. Right now you can save big on OREO Thins Bites and ID OREO Iced Coffee with Ibotta and Walmart! With Ibotta you can receive $1.00 off the limited edition International Delight OREO Iced Coffee, $.50 off of the new OREO Thins Bites PLUS when purchased together you will receive an additional $.50 off! How awesome is that! But hurry as this offer is limited and the limited edition ID OREO Iced Coffee will not be around long as it is simply too delicious! I hate regular OREO’S don’t know why but just not my thing. But give a OREO thin bite and I am so happy. im not sure if this sounds amazing or gross, but im game! I like the Tin Bites but haven’t tried the iced coffee yet. This is a great deal! I love those thin bites cookies they are cute and delicious. Is there really any better combination? I totally agree! So good and delicious! ibotta is cool and those cookies look great too! Those look really good. I’ll see if I can find them. 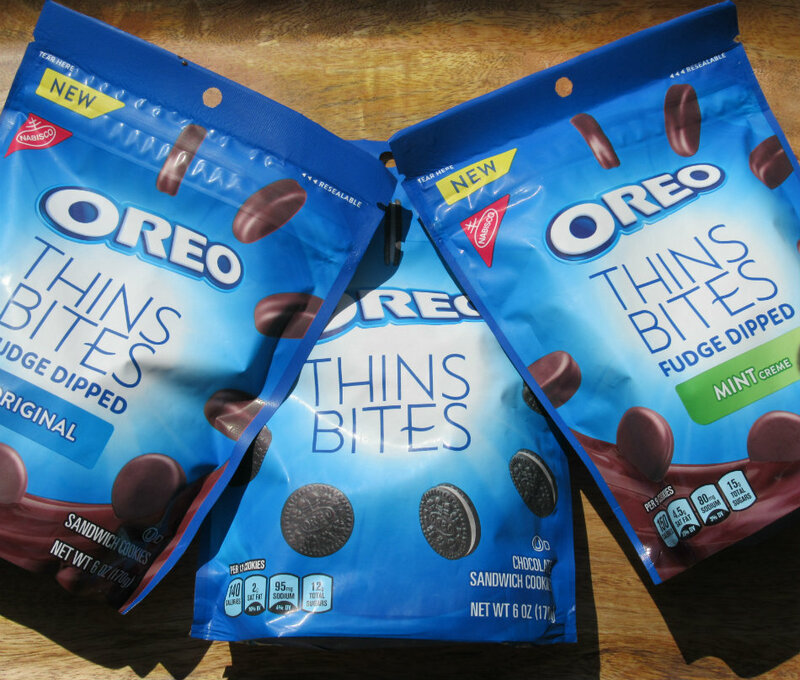 Huge fans of Oreo here but we don’t have the Oreo thin yet in the UK! They sound amazing! Hopefully they will have them there soon! They are delicious and I love them more than traditional OREO’s! That is loads of savings especially if Oreo’s a staple in your home. I think it’s definitely worth taking advantage of! Thanks for the heads up! Coffee and Oreo Coffee Creamer and Oreos WOW just WOW… I love it. I just love it. Thank you for this idea. Lots of love.. The thin cookie bites look so delicious! I’m afraid once I start I won’t be able to stop! Ooo yum – I love Oreo’s! Ive not heard of the thin bites though, are they available in the UK? I’ll have to try them! I am not sure if they are available in the UK… but you will love them if you like OREOS in general. I actually like the thins better as they are thin and crunchy. If you do not have them I am sure that you will soon. Thanks for stopping by! I enjoy an oreo and these thin versions sound just as delicious indeed! I love the sound of coffee flavours too. YUM! OMG this is so so unfair 🙁 we so don’t get these in India! How we want them! OMG! I love Oreos. Now I have to go get these. I have not tried any of these yet. They do look delicious. Oh wow… I love Oreos and coffee!! I need to try this soon! It sounds delicious! Oreo cookies are a favorite of many. You can do a lot of delicious recipes out of them. I guess I never look but I didn’t know that International Delight made Iced Coffee. Wow, next time I am in Walmart I am going to check this out. Oreo and oreo coffee dreamers sounds so yummy would love to have it..
What an awesome combo! Thanks for the deal too! In my mind, I thought an Oreo Thin Cookie could. Not be a true Oreo cookie without the creamy white center. Well I was wrong again! I love these Oreo Thin Bites and now I can’t wait to try the ID Oreo Iced Coffee! It is really hard to be a good Diabetic with all of these tasty snacks and drinks readily out their!! These sound like they would be a great thing when all you want is just a little bit of a sweet. I love Oreos! I would love to try the thin bites. The iced coffee, not so much… I do not like coffee. These Oreo Bites sound delicious! And what a great deal, thank you so much for sharing! I would love the fudge dipped mint. They all look delicious. I love iced coffee and this looks delicious! Oreos and iced coffee both sound wonderful right now. I like the Oreo Thins the best! I love oreos! Will definitely be trying the iced coffee! I have added this to my Walmart list. I love Oreos and iced coffee so I’m sure this is wonderful. Thanks for this post. I have not heard about it. These sound delicious. I know that they would be a bit hit with family members. I love Oreo cookies. 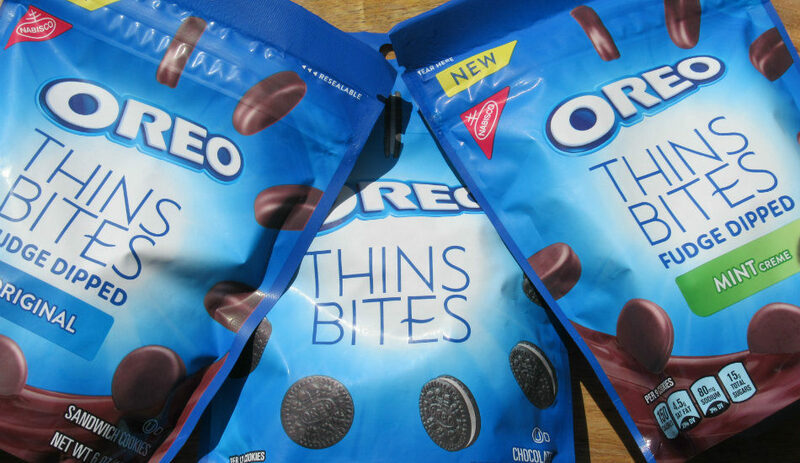 I love these Oreo Thins, they are so good! The family loves them also. It is fun to try new products. These look delicious! I have always loved Oreos growing up and always look forward to their new products. Nothing like a good ole fashioned Oreo dipped in milk. This is absolutely genius! And such a dream come true! I can’t wait to try this.